Everything you need to know about the oil tankers | JCBL Ltd.
All the major transportation of fuel and liquid products is done through tankers. There are different types of oil tankers – Petroleum, Water, Edible Oil, and Chemical Tankers. Among these the most popular is Petroleum Tankers used to transport petrol, diesel oil and some types of inflammable liquid. These tankers are fabricated according to need and capacity of the customers. These tankers can be big or small, pressurised or non-pressurised, carry single or multiple products. As per the earlier rules of 2002 Petroleum Act, the net carrying capacity of the oil tanker was limited to 25KL. In 2011, 2 amendments were made in this law – firstly, the carrying capacity of tankers was increased to 40KL and secondly, the companies can use other suitable materials like stainless steel, aluminium, and FRP in place of iron and steel for body building of tankers. These two amendments proved beneficial for oil transportation industry, now they can use light vehicles instead of heavy tankers for transportation and reduce operational costs as new materials are rust proof and require less maintenance. With the increase in population and industrialisation the need for petrol is growing in every nook and corner of the country. Seeing the rising demand many private players from the unorganised sector have started the bulk production of these petroleum tankers to cater the requirements. Petroleum transporters build chassis from different oil tanker manufacturers and utilise and customise them according to their need. Everyone wants to reap the profits even if it means compromising with the quality. The safety and security of these tankers is a big question. The material, basic designs, and structure of these tankers fail to meet the requirements set by the authorities.It is very important for oil companies and depots to choose a vehicle whose safety can be trusted and most importantly which meets industry standards and requirements. Seeing the need and demand of Petroleum tankers which are safer and a long-term companion, JCBL is introducing “JCBL Oil Tankers” these oil tankers can be customised and designed according to the desire of customers. The manufacturing of these petroleum tankers is done in our heavy duty fabrication unit which consists of CNC plasma hydraulic press, CNC plasma cutting, state-of-the-art Weld shop with MIG Welding and Fixtures for accuracy, Paint shop which includes Automated SKD Blasting, full shot blasting, and Paint Booth. Investment in research & development, technology collaborations with International players, design houses & other companies has enabled us to stay ahead of our competition. ‘Mach’ Shaped Tank- Robust & Reliable Performance. Fully Automated Production Line. - Delivers much more consistent quality and highervolume of production. As per OISD 167, API 1004 and PESO Recommended Practice. 4’’ MM thick Disc Partitions helps to ensureEffective Liquid Surge Control and Arrests Wobbling. Reduces vibration forces and offers smoother rides. Continuous Updating of pilfer-proof design as per OMC. CCOE approved Petroleum Road Tanker Safety Fittings. made of Stainless Steel to avoid rust and reduce the maintenance cost. Hygienic and safe surface finish. Safety is ensured through Pressure vacuum valve - whenever the pressure inside tank exceeds the optimal level, the relief valve opens automatically and harmful gases are discharged which reduces the pressure. When a safe pressure level is achieved, the relief valve shuts itself. In case of emergency, shut off valve cuts the flow when unloading pipe is damaged. When the valve fails or gas leaks out, the emergency shut-off valve stops the leakage. Top Loading: Fuel is loaded into the oil tankers through the dome (covers) on top of the tank through loading arm. Bottom loading: Fuel is loaded into a tank through the same lines that are used for unloading. Reduced Fire Risk: In top loading, the splashing of fluid can build up electric charges inside. Men moving on the top of tankers make it even more dangerous. The bottom loading tankers reduces turbulence thus lowering chances of spark. The presence of valves reduces spilling of oil at both loading and unloading centres. It also reduces wastage of oil and fire chances. In top loading a person has to get on top while loading, bad weather conditions and inhaling of hazardous petrochemical vapours can prove fatal. In bottom loading, the operator stands safely on the ground and can act safely in case of any accident. During loading the manholes are open in top loading petroleum tankers and products are easily contaminated with dust, rain, and other items. It is easily eliminated in bottom loading petroleum tankers. The loading in bottom tankers is faster as compared to top loading tankers. In top loading tanker operator has to manually climb the tanker and fix loading arm in it and also loading rate in faster in bottom loading tanker. 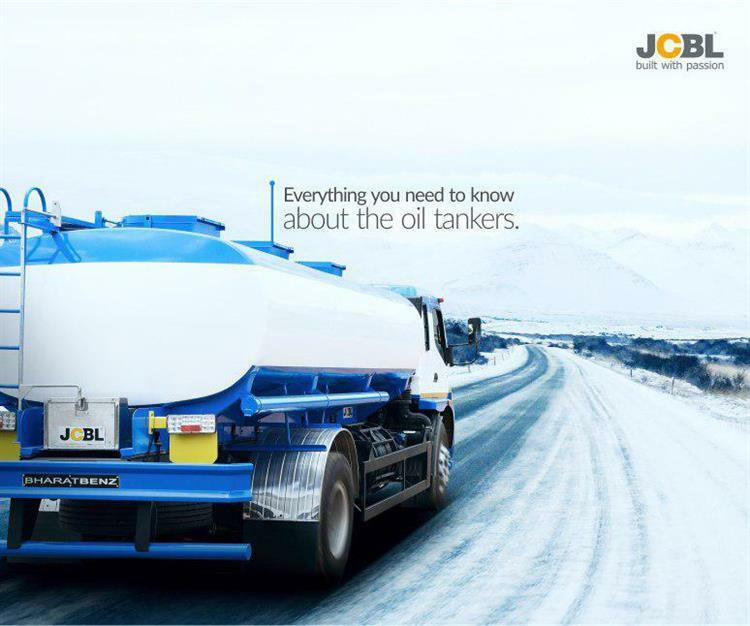 Why choose JCBL Oil Tankers? Confirms to ARAI norms, CMVR rules, and other legal requirements. When you choose JCBL Oil Tankers you choose a product that is a reliable, safe and customised solution to your need. There is no compromise in quality, material and we obey all safety and standardisation laws implemented by the Govt. India has a huge market which is still to be tapped. The reasons include low operational cost, less stringent environmental safety laws and new laws favoring the flourishing oil refinery network in the country. Have any questions in mind or want to share any valuable information? Please comment below. Very impressive, looking for Bottom loading tank. JCBL Ltd: Thanks Andan for sharing your feedback. Planning to buy a new tanker with 18 kl capacity in Kerala. JCBL Ltd: Thanks Vanju, Our team member will get in touch with you. Can we plan the bottom loading for chemical tankers. Corrosive chemicals.